i see no reason to leave a perfectly beautiful seat like that empty. and...another beautiful little face to add to your family could ONLY be a great idea :)your kids are adorable (and to tie in with my "target" comment)and every great circus act needs a BIG family :) (or is it that every big family feels like a circus act? hmmmmm........)- Have a wonderful day! Happy Autumn! I do love those chairs! I am so glad they were still there. I confess that -- although I've never met you -- I was at Glendale Target the next day, and began the journey to the furniture section to see if the chairs you described were there. I was seriously considering getting them for you if so. I'd have to find your email, and write something about how you don't know me, but I just bought dining chairs for your home. And that yes I'd take a check for the purchase amount, as soon as your spouse got around to depositing his. But then, something happened. Something not quite as dramatic as your story, but it did involve a screaming child. And alas, my one-second thought of good intentions went by the wayside. The chairs are perfect, btw. 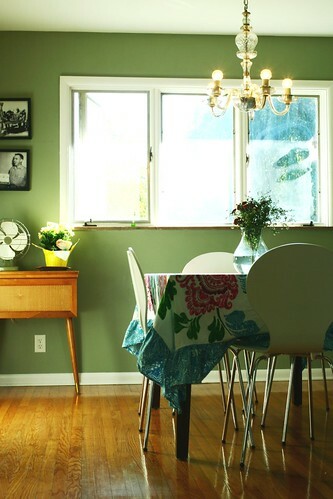 I'm in LOVE with your dining room! I'm also SO happy that your chairs are no longer at Target but are in their rightful place in your gorgeous dining room. p.s. If you ever invited me over I might steal your tablecloth. p.p.s. Not really, I'm not a thief, but I do looooooooove it! Yeah for Moms that save the day and buy the chairs. So fun to have Mom that close. I didn't comment on the Target post, but I have been there. Because of you, I commented to a mother of 4 kids yesterday in my Target that she was doing a great job. 3 of 4 kids were causing trouble, but I wanted her to know that she was doing fine. She gave me a shocked look, but said thank you. I hope I made her trip just a bit better. Have a great day and enjoy your new chairs! Oh! I have those same chairs. Two brown and two green. What?! Luke doesn't READ your BLOG? My husband doesn't read my blog, either. Probably for the best - not because I say anything he wouldn't like, but I'd probably suddenly get self-conscious. I'm so glad you got those chairs. They are perfect. Those chairs were meant for that table and that table cloth (anthro? drool) since the day they were born in the Target chair factory. Perfection! I read your Target story a few days ago, but couldn't comment as my hands and arms were otherwise spoken for. I'm so glad things are better. Sounds like a tremendously low moment you'll always remember, but that's a good thing, too. The next time an epic tantrum strikes, and IT WILL, you'll have the memory of surviving and thriving and even laughing. 4 kids is good. Twice that, even better. ;) But if you have more, you'll have to replace those awesome chairs with horrendously ugly benches. Cough. I think I have a crush on your tablecloth. Weird? Your dining room is cute and those chairs were the deal of the century next to those deals that are free and don't cause extreme embarrassment. You'll find a way to get another baby. Maybe some teenager will read your blog and think you are a good mom and have a baby in her parents' basement and then drive it to your house and drop it off in a basket on your front door. You would love that baby too, wouldn't you? yes the tablecloth is from anthro. it was one of those $118 marked down to $29 kind of deals. and yes marlene, i would love that baby too. gah! i'm so glad i found you. or you found me. or elizabeth somehow found the both of us. three kids three and under? woman! I've thought before that there are a limited number of people types out there and we keep meeting variations of them over and over again. Glad to hear that I'm not the only one! Erin- I love your dining room. 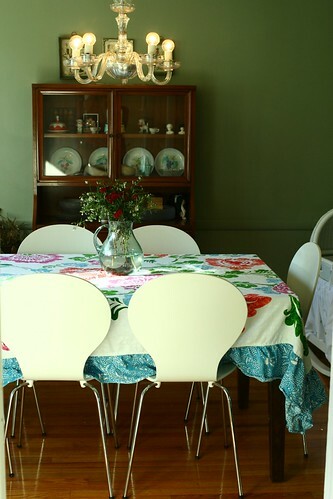 those chairs are awesome and ooh, I love that tablecloth! I love how you put things together. I love the dining room. I love those chairs. I am so glad that your mom was able to get them for you. Just stumbled on your blog from my friend Elizabeth over at Gossamer Wings. I love it! It is nice to meet you! The chairs were worth it and I get that assembly line feeling about people, too. I love this. I think that about people all the time. Like when someone tries to compare your kid to a relative from your extended family and you think - maybe they're just alike because there are only so many types of personalities, or because it's easy to draw connections between people and the things they do, or because we view everything new through the lens of what we already know. Not because they're related, you know? And I have never seen Titanic. And I keep not seeing it just to keep not seeing it.